Most commercial truck operators are experienced and responsible, but truck driver mistakes still occur. 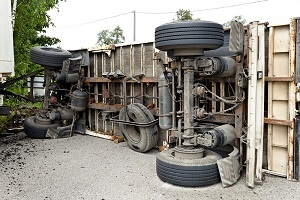 The Federal Motor Carrier Safety Administration has published a Large Truck Crash Causation Study (LTCCS) outlining the most common causes of commercial truck accidents. Brake problems, in 29 percent of collisions. Defective brakes or a lack of proper brake maintenance can result in long stopping distances, or even complete brake failure. Prescription and illicit drug use, 26 percent. Drugs can impair motor skills and cloud a driver’s reasoning ability. Speeding, 23 percent. The impact force of an 80,000-pound truck becomes even more devastating when the driver is speeding. Lack of familiarity with the roadway, 22 percent. Truck drivers are often required to drive in unfamiliar areas. Improperly constructed or maintained roads, 20 percent. The failure of a government agency to properly design, construct, and maintain a roadway can lead to serious collisions. Over-the-counter (OTC) drug use, 17 percent. Even OTC medications can lead to truck accidents when the drugs are not taken as directed. Lack of surveillance, 14 percent. Inadequate surveillance occurs when a big rig driver does not properly observe his surroundings. Fatigue, 13 percent. Driver fatigue is a big problem for truck operators, who are often required to spend many hours on the road. Traffic control devices. Poorly programmed or defective traffic control devices can lead to a collision. Traffic congestion. Traffic flow may be interrupted by an overpopulated roadway or another collision, and a truck driver may cause an accident by rushing to get back on schedule. Truck accidents can be devastating, resulting in severe injuries. If you’ve been hurt in a truck collision, you deserve compensation. To discuss your claim, contact the law offices of Steve M. Lee, P.C., by using the form on this page.